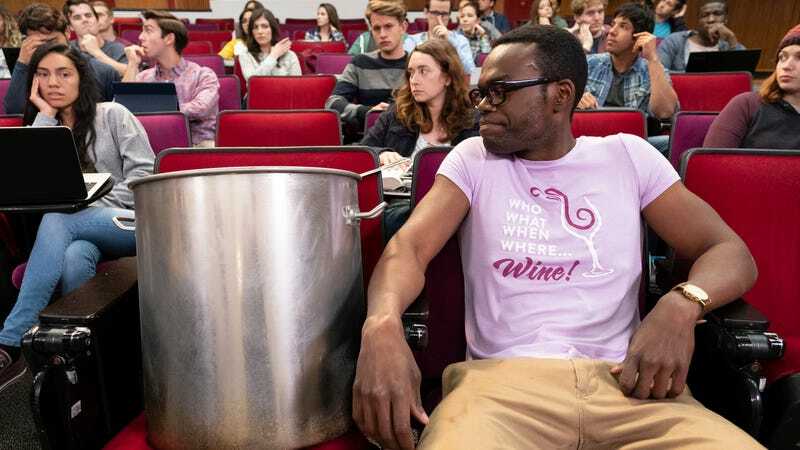 The Good Place’s Chidi Anagonye regularly performs a symphony of comic TV anxiety for our benefit, from his frequent stomachaches, to his various pastry dilemmas, to the masterpiece that was his “Peeps chili” breakdown, one of the funniest sequences to grace a network sitcom in years. Given his talent for portraying it, then, it’s not entirely surprising to learn that actor William Jackson Harper comes by his angst honestly, something made abundantly clear in a recent profile he did with Vulture. During the wide-ranging conversation, Harper talked through a variety of anxieties, ranging from his feelings about his body, to flop-sweating at parties, to his childhood fear of the Bad Place itself. One hundred percent. Neurotic, anxious. The major difference between me and Chidi is that he talks about it a lot. When I’m feeling neurotic and anxious, I just completely disappear. I don’t want anyone to be dealing with that or see it. I remember I was on a date some years ago. We met at a party and we had a great time, and then we went on the date and I was really nervous. Eventually, after a couple of drinks, I started to relax. Then she said to me, “Oh, there you are. I was wondering when that guy was going to show up.” Of course, that weirded me out again immediately. I was right back to where I was.